Mr. Nobody tells the tale of Nemo, the oldest and last living mortal on Earth in the year 2092. Over the course of approximately 2.5 hours, Mr. Nobody shares multiple versions of his life’s story, frequently in non-linear fashion, and ponders the importance of choosing the right path versus actively choosing to view your path as the right one. Symbolism and gorgeous imagery abound. It’s a drama and romance with elements of scifi and fantasy. Mr. Nobody contemplates string theory, the Big Crunch, the principle of entropy, pigeon superstition, and other geeky stuff. Mr. Nobody premiered at international film festivals in 2009 but wasn’t distributed in the U.S. until 2013. Movie Maker interviewed director Jaco Van Dormael and asked about the delayed release to US audiences. Van Dormael is as mystified as the rest of us, describing any project’s international distribution trajectory as a “message in a bottle dropped in the sea.” A rather romantic metaphor, and perhaps unsurprising, given the film’s sweepingly philosophical thematic underpinnings about destiny, choice, and the possibility of true love. Mr. Nobody won Best Picture and five other top honors at the 1st Magritte Awards in 2010. While the movie wasn’t widely distributed or acknowledged in the U.S., the reviews that were published were consistently good. Rotten Tomatoes: Four out of five top critics rated Mr. Nobody as Fresh; on the general Tomatometer, it rated 64% Fresh. Mr. Nobody's narrative tangles may bedevil as much as they entertain, but its big ambitions and absorbing visuals make for an intriguing addition to director Jaco Van Dormael's filmography. What is “Mr. Nobody” about? For one thing, it’s about that universal sense that life has passed you by, and the longing for the nonexistent reset button that will allow you a second chance. It’s also about the nature of time and causality, and the notion that many — perhaps infinite — different paths might coexist at the same time. Van Dormael's intriguing script is more than matched in his flamboyant direction of this 2-hour-plus tale, heroically edited by Matyas Veress and Susan Shipton into a fluid, generally understandable narrative. While Nemo wonders why time only goes in one direction, and ponders the possibility of smoke returning into a cigarette, the filmmakers have no trouble turning the hands of time backwards and forwards. But this is never done for cheap thrills; everything comes back to the idea that human life is precious in all its complications, and every choice we make has its consequences. Nemo narrates a voyage through several permutations of his life, following alternate paths. He chooses to grow up with each of his divorcing parents (Natasha Little and Rhys Ifans); has three separate and mutually canceling lifelong romances (Juno Temple grows into Diane Kruger; Clare Stone becomes Sarah Polley; Audrey Giacomini becomes Linh Dam Pham); and experiences various brushes with death.
. . . it’s about love and life and entropy and decay and the fateful choices you make and what you might make if you could choose again. . . But it is fascinating to chew on and mull over, a cryptic “puzzle picture” set in the playground of the psyche, a movie about the present, the past and the future and the wonder of how any of us is strong enough to make a choice, a decision, about anything. My own back story: About a month ago, my teenage daughter began referencing the movie, Mr. Nobody – more than once her comments focused on how HOT Jared Leto is, so I didn’t immediately add the movie to my queue. But she’s a smart girl so I made a mental note to check it out. I’ve since watched it twice, the second time in part because I really wasn’t sure of what I’d seen. The story is dream-like and changes directions over and over. I plan to watch it yet again because I keep thinking about it – for me, that’s the best kind of movie. I wanted to learn more about the symbolism and themes that recur in Mr. Nobody, so I rushed to FanFare, where I expected to find an enlightening discussion . . . but sadly, there was none. So if you’ve seen it, what did you think? If you haven’t, it’s streaming on Netflix. I remember enjoying the movie, but saw it too long ago to offer any personal enlightening insights. Will have to do a rewatch. Anyhow, maybe David Bordwell's essay "Film Futures" will help (and his "What-if movies: Forking paths in the drawing room"). 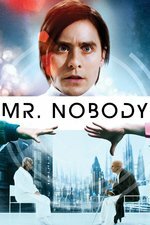 Neither of the essays is written specifically about "Mr. Nobody", but they tackle movies with similar logics/narrative structures. One essay I can recommend that is also about this specific movie is Sonia Front's "Traumatic Bifurcation" (Google Books has a couple of pages missing as always, but the general idea is graspable nevertheless).